Queensland Premier Annastacia Palaszczuk poses for photos in her office in Brisbane, Sunday, Feb. 14, 2016. 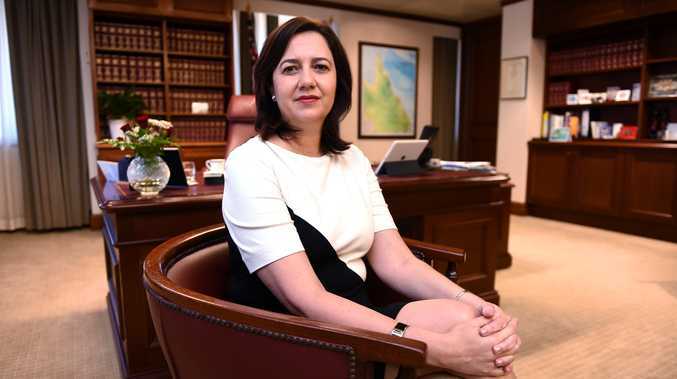 QUEENSLAND Premier Annastacia Palaszczuk and her office have ignored questions on whether she will follow PM Malcolm Turnbull's example and scrap former MP's travel entitlements - sooner rather than later. The most recent report into former MP's travel shows the total cost of the controversial entitlement, for all MPs, was $295,820.54, over the course of 2015/16. The Premier's father Heinrich Palaszczuk claimed $8779.20. Mr Palaszczuk, who was a Labor member of the State Parliament for 22 years, spent the second largest amount of any former Queensland MP in the past financial year, topped only by fellow Labor MP Jon Sullivan. In September 2014 the Queensland Remuneration Tribunal, which was brought in by the Newman Government to adjudicate on politician's perks and pay, moved to scrap free travel for former MPs after receiving thousands of submissions against it. Notably while the general public were almost unanimously against slugging the taxpayer to maintain the perk 26 former MPs wrote letters to the Tribunal with the vast majority defending it. "I received an annual business class air pass for my wife and me to any destination in Australia, New Zealand or Papua New Guinea," one former MP anonymously submitted. "This too I believe should remain for those such as I who have qualified for the pass. "I regard these conditions as my retirement package and do not believe that any subsequent government should be able to change any of them." Another said former MPs and their families remain as public figures even after they retire, or are voted out, and as such the free travel was a sort of compensation. However, there was at least one former MP who didn't like the entitlement. "I expect it to be a lonely voice amongst ex MPs, that there is absolutely no justification for any allowances for ex MPs," the ex-pollie wrote. "If someone can mount a plausible public interest argument in defence of ongoing allowances funded by ordinary taxpayers, many of whom have less means than the ex-MP, then I would be interested in hearing it - and more interested in testing it in the court of public opinion." In the end the Tribunal found against the former MPs and recommended scrapping the entitlement, however, there was a catch. However the changes were not effective immediately, instead the Tribunal extended the entitlement for another four and a half years in consideration of the fact: "travel plans may already have been made into the future." In October last year four former Federal MPs lost a High Court appeal against being stripped of their Life Gold Travel Passes - effectively removing any legal hurdles for governments looking to get rid of perks for former pollies.